For the first time since 1978, a first-term president hasn’t reappointed the incumbent Fed chair. Instead, President Trump will appoint existing Fed governor Powell. 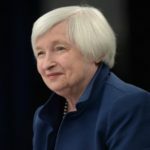 He will continue the process of gradual rate rises established by outgoing chair Yellen, but offer a lighter regulatory touch. As Yellen’s term as a Fed governor doesn’t end until 2024, I sincerely hope she stays. It would be the first time that’s happened since 1948.